From October 2-4, 2018, the Rehabilitation and Community Providers Association (RCPA) hosted its annual conference: Fueling the Future, in Hershey, PA. The Behavioral Health & Economics Network (BHECON) sponsored two sessions focused on Certified Community Behavioral Health Clinics (CCBHCs) and their impact on the state landscape. Pennsylvania currently has 7 CCBHCs established by the Excellence in Mental Health Act of 2014. Over 50 session attendees had the chance to hear panelists share insights on a number of key topics pertaining to the CCBHC demonstration, including use of the prospective payment system (PPS) rate to help expand evidence-based care services, increased access, movement towards a value-based payment (VBP) system, integrated care, implementation of mobile crisis services and substance use disorder treatment and the increased usage of data and reporting metrics. CCBHCs in Pennsylvania have been able to increase their workforce and subsequently the total number of patients served within and outside the four walls of their clinics. Speakers shared the enormous improvements both in service delivery and in client wellness from the CCBHC model. Other topics of interest from attendees included staff satisfaction, peer supports, financial and regulatory hurdles, and relationship-building between providers, among others. A follow-up session, Collaboration in Certified Community Behavioral Health Clinics: The New Frontier of Delivery Models, centered around creating and implementing Designated Collaborative Organizations (DCOs). This o benefits and lessons learned from the processes of developing new models of collaborative initiatives with community-based health and social providers. The value of working collaboratively can be evident but not always easy, with each setting of care having local, distinct, and multiple factors that can either support or be a barrier to collaborative practice. 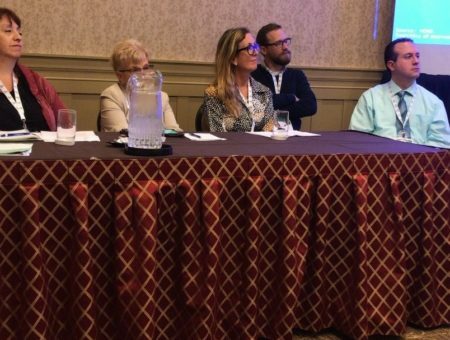 The presentation focused on practice setting variables and essential elements of quality collaboration, and attendees were able to ask questions around both the challenges and benefits of such strong and formalized community partnerships. Panelists emphasized the success of providing seamless, high-quality care to clients and ultimately, improvement of mental health outcomes. In all discussions related to CCBHCs, inevitably the conversation shifts to sustainability. Congress may decide not to continue this value-producing program beyond the initial two-year demonstration period, and CCBHCs are not willing to lose the phenomenal progress they have made to increase their treatment outreach and community partnerships. In Pennsylvania, CCBHCs are currently exploring their options to retain their programs and staff should the demonstration come to an end.